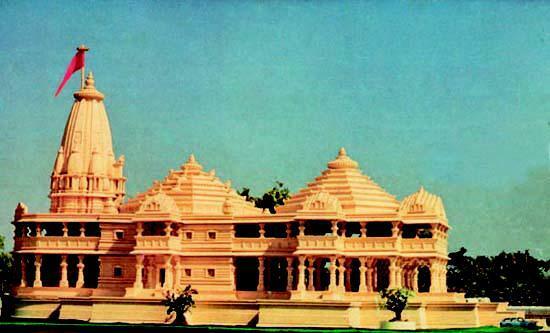 JAMMU: The Rashtriya Swayamsevak Sangh (RSS) and its allied organizations have all been gearing up for mega show of strength in Jammu to build pressure on the central government to pass an ordinance in the upcoming Parliament session for construction of Ram temple at Ayodhya. “Two mega rallies will be held in Jammu-- one at Bhaderwah on December 9th and the other at Parade Chowk in Jammu City on December 16,” reliable sources informed The News Now. They informed that although, the Vishaw Hindu Parishad (VHP) is at the forefront, but the allied organizations of RSS like Bajrang Dal, ABVP etc have been working day in and day out to mobilize people and make these events successful by ensuring maximum participation of people. VHP state president Leela Karan Sharma said that the entire programme will be led by “Sant Samaj” in which many renowned people from outside the state will also be participating. “The purpose of holding these rallies is to build pressure on the central government to pass an ordinance in the upcoming Parliament session to pave way for construction of Ram temple at Ayodhya,” said Leela Karan, who recently led a delegation to Raj Bhavan which submitted a memorandum to Governor Satya Pal Malik demanding a Law to be passed by the Central Government for construction of Ram Mandir. He said that besides the VHP, the allied organizations of Sangh and like-minded people who are in favor of constructing Ram temple at Ayodhya, will be participating in the rallies. “We are all working together to make the events successful,” Leela Karan said. Sources informed that series of meetings have been held at Sangh shakhas where volunteers have been assigned duties for mobilizing people. They informed, “MahanagarBaithak (meeting) of RSS was held at its Jammu headquarter, Keshav Bhawan, a couple of days back during which the entire programme for Jammu rallies was finalized and the swayamsevaks (volunteers) were assigned duties to make the mega event successful”. They said, now Nagar baithaks of RSS are going on at different places in Jammu to give final shape to the programme and make the events successful. There are around 250 RSS shakhas which run on daily basis in Jammu and the swayamsevaks (volunteers) of all these shakhas have been assigned task to mobilize people. Sources informed that in Jammu rally, people from across the Jammu region, particularly from Udhampur, Rajouri and Kathua, will be participating, while the December 9 rally at Bhaderwah will witness participation from Bhaderwah, Doda and Kishtwar locals.